I got this Showa 14.10 (October, 1939) pistol along with a Type 44 carbine from a collector in Nova Scotia in November, 2005. The carbine was very nice, but I knew when I bought this pistol that it was a clunker. It is a shame, because it is a rare variation, the same as my 14.11: it is the transitional model with the large trigger guard (implemented in September, 1939), but without the magazine retention spring (added sometime in December, 1939). Only 5,750 pistols were made with this combination of features. It looks like the gun was probably rusty and someone made a very unsuccessful attempt to “improve” it. The barrel assembly appears to have been bead-blasted, which removed a lot of metal. Then someone took a grinder to the sides. They also defaced the serial number, date and model markings. The gun is mostly complete and the parts that are there all match. It is missing the magazine, magazine latch and spring, and the sear bar and its pivot pin. The right grip was cracked and glued back together. The left side shows the same problems. The black hole in the grip is for the magazine latch. 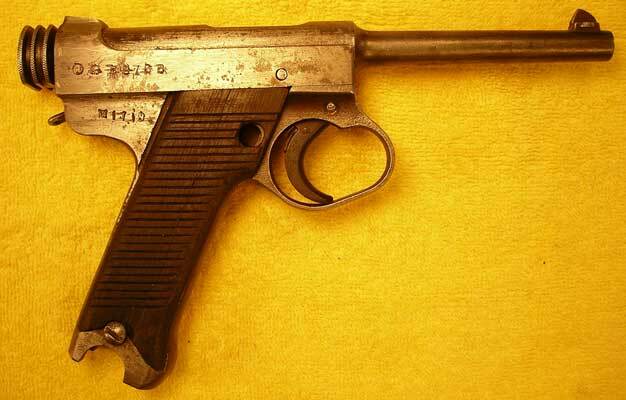 This pistol was made by the Kokubunji Factory of Chuo Kogyo, which came into being when Kijiro Nambu’s company, Nambu-ju seizosho, merged with two other firms in 1936. 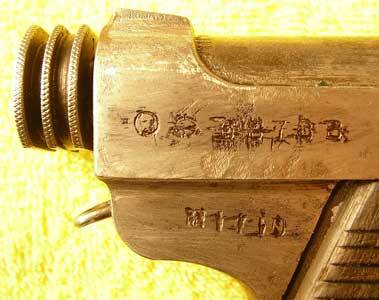 Guns made at Kokubunji are also often called “Nagoya Nambus”. Production was supervised by Nagoya Arsenal. Here are the markings on the right side of the frame, which someone badly defaced. The first symbol means Nagoya Arsenal, which supervised production. The next symbol is the character nan (or nam), short for Nambu, which was the symbol of Kijiro Nambu’s company and continued to be used by Chuo Kogyo after the firms merged. The serial number completes the top line. The lower line begins with the character sho, short for Showa, the name of Emperor Hirohito’s reign. The date 14.10 means the tenth month of the fourteenth year of Emperor Hirohito’s reign. 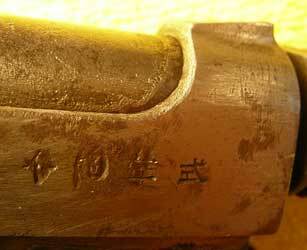 These marks were so badly defaced that the previous owner thought they were kanji! This is the model marking ju-yon-nen-shiki, “Year 14 Type”, or as we would say, “Type 14”. This appears on all Type 14s, but here only the last character on the right has escaped being defaced. Note that it looks like the barrrel assembly was bead-blasted while it was still sitting in the frame. This accounts for the ragged line you can see on the barrel extension that parallels the front contour of the sight bridge. The part that was inside the sight bridge was not affected by the bead-blasting. I bought this gun because it was extremely cheap, so I knew I wouldn’t lose even if I just used it for parts. I am not sure what I will do with it. I may reblue it, stick in the missing parts and keep it in case I am asked to rent one as a movie prop. 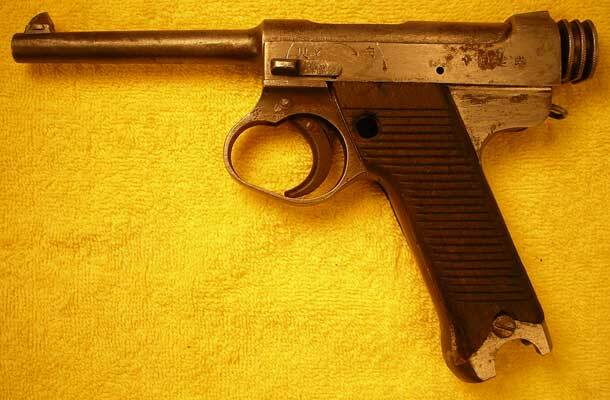 I would hate to subject one of my good pistols to the abuse they get in prop departments, but I wouldn’t mind letting one like this out of my sight. Once it is reblued, it would probably look OK as long as they didn’t zoom in for a close-up side view of the pistol. I have also toyed with the idea of converting it to blank-firing. Last updated: November 27, 2005. All contents are copyright Teri unless otherwise specified and may not be used elsewhere in any form without prior permission.